This cheese stuffed meatloaf is a total comfort food. You’ll be coming back for seconds! Meatloaf conjures up thoughts of slabs of bland, dry ground meat for most folks. Here’s the recipe that your grandma probably didn’t make (not that I’m sayin’ Grandma’s meatloaf was the dry slab I mentioned earlier, but there has to be a reason so many people hate meatloaf). It’s one of my kids’ favorite meals these days. The meatloaf itself is juicy and tender, and the center is filled with ooey-gooey mozzarella cheese, thanks to two string cheese sticks baked into the middle (fresh mozzarella, cheddar, or any other melty cheese works great, too)! I think it’s time you revisit this retro dinner entrée! Looking for a meatloaf recipe that doesn’t use beef, pork or veal? Try my Turkey Meatloaf! 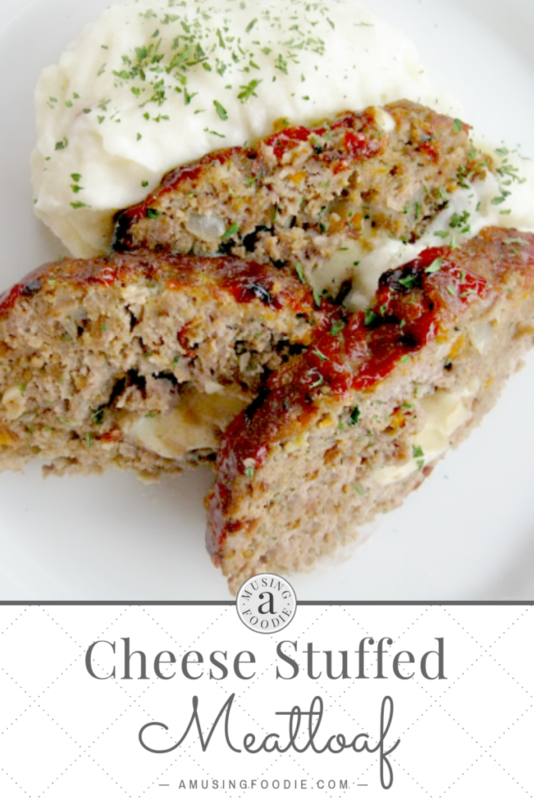 This cheese stuffed meatloaf will have you going back for seconds! Preheat the oven to 375°F. Cover a baking sheet with foil and set aside. Heat a skillet over medium, add the bacon and cook until crispy. Remove the bacon to a paper towel to drain and cool, then crumble it. Add the carrots and onions to the bacon skillet and sauté using the bacon grease until the onions become soft and translucent, about 5 minutes. Add the garlic, continue cooking for another 2 minutes and then remove the skillet from heat. In a large bowl, gently combine the meatloaf mix, egg, Worcestershire sauce, bacon, onion garlic powder, parsley, salt, pepper, tomato sauce, bread crumbs, and the onion/carrot/garlic mixture (use a slotted spoon to scoop them out of the pan so you don’t get too much grease). Move the meat mixture to the covered baking sheet, and spread to 1/2″ thick – the shape doesn’t matter. Place the two string cheese sticks side-by-side in the middle of the meat, and then shape the meat around the sticks until you get a traditional meatloaf shape, about 9-10″ long. Spread the ketchup evenly on the outside of the loaf. Bake for 50 to 60 minutes, or until the cheese starts to ooze out the sides. Let cool for 10 minutes before slicing.